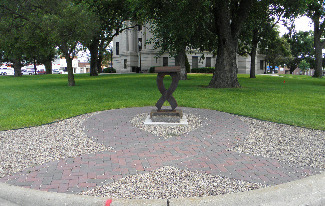 Located on the southwest side of the courthouse lawn is a 911 Memorial. The steel I - beam is from the World Trade Center, which fell after the September 11, 2001 attack on the twin towers in New York City. The I - beam sits on a "Remember our Troops" steel ribbon. A brick sidewalk highlights the path up to the monument and plaque.